Wednesday 7th June was Round 2 of the Gilchrist Cup. This time Banbridge CC where taken on the very popular Gilford Scarva circuit. With 29 riders signed on for the club event was a great turn out on a damp dark June evening. We were glad to have guests from TVR, Apollo and Rotherham Wheelers and Cooktown CT take part. The five mile circuit with a few short hills makes his one of the most popular circuits on the club calendar. With the riders split up into 5 groups, it’s not an easy circuit to stay away on. 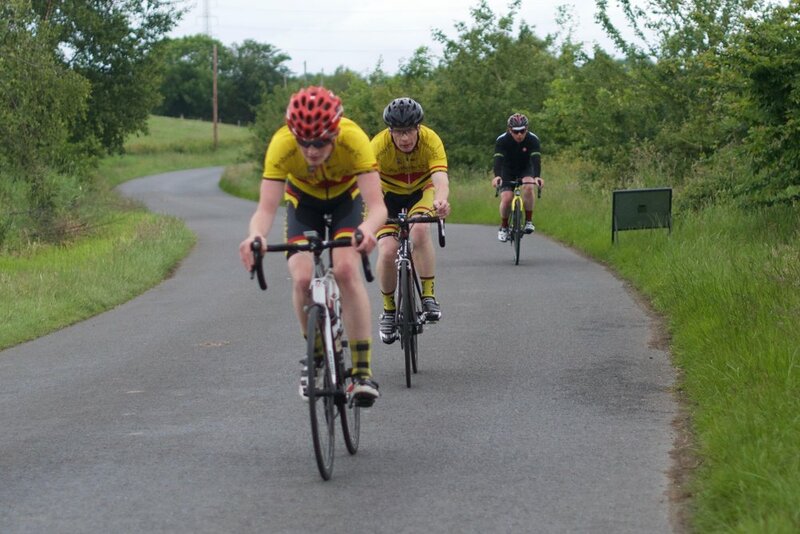 Sara Glover, Paul Hannigan, Leslie Creighton and BCC club debut for Peter Bell were set off in the first group to try and stay away as long as they could. With a tail wind to Gilford it was a great start to the race for the first group, the second group had still over 3 minutes to close at the end of the first lap. All riders where away and it wasn’t long till the scratch group of Dan Purdy, John Buller and Tim Beattie caught the 4th group on the road at Gilford on the first lap. These guys where on a mission tonight but it wasn’t until the start of the 4th lap till the scratch caught the lead group on the road. They hit the front with all hell braking loose as they turn left onto the Gilford road and with the short climb it was time for young John to put the hammer down. With bodies everywhere on the Gilford Road, Simon, John and Dan where to too strong for almost the rest of the field drilling it down into Gilford. At one point in the along the road it was a John Buller steam train will at least 8 riders in one big long straight line behind him trying to stay on his wheel. The 4th lap was fast but the last lap was a lot worse. With Dan putting the pressure on at the start of the lap it was going to be fast and boy it was, with the Strava lap record being smashed in the process. Entering the last corner Simon was first to light up the afterburners and blew the field wide open except for Stevie Fitzsimmons who managed to hang onto his wheel and passed him to take his first Banbridge CC club race win. Simon getting a brilliant ride for 2nd and Brian Hannon taking 3rd, never far away from the top spot. Thanks to Alan and his team of Marshals and the timekeepers making it a great safe night. Not forgetting our two Lead cars escorting the riders!